Here at Crofton we use only the best folding doors. The Eurocell door is the best PVCu system available in the UK. It is one of the few systems to feature an inline track. Most PVCu doors have the track bolted to the outside of the outerframe, this means they drop and cause problems. Eurocell door gives the perfect excuse to bring the outside in, without worrying about reliability. Want to see them in action, watch the video here. Eurocell folding doors are available in a choice of colours. These also include the option of having a colour on the outside and white on the inside. Maximum sizes are 900mm per bay with a minimum size of 600mm per section. If you need a wider section, you need to consider our aluminium doors which can be upto 1200mm wide, whilst maintaining a beautiful smooth action. 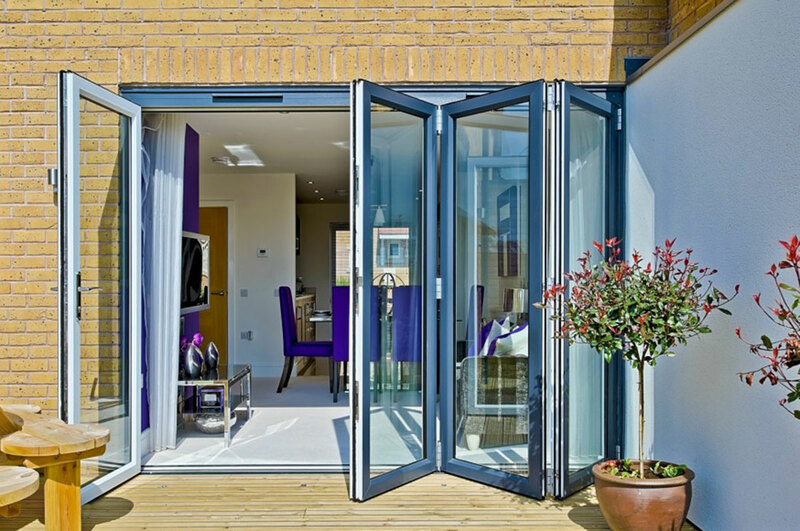 For further reading on our PVCu folding doors click here. Here are some of the options available in terms of opening doors. If you really want the very best come and see our display of Aluminium folding doors from both Smart Systems and also Schuko. These systems are even better in operation than our already impressive PVCu system. Aluminium has a smaller profile, but is stronger and has larger sections giving impressive viewing, closed as well as open. In terms of thermal values, PVCu offers superior insulation values, aluminium however offer slimmer lines.